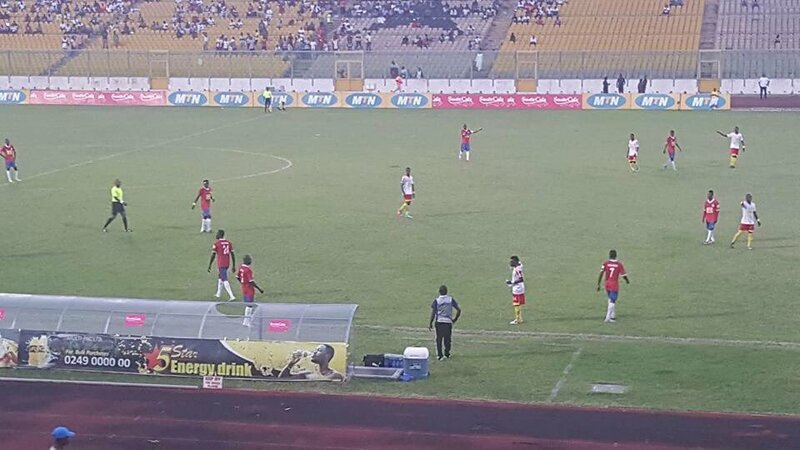 Okwahu Utd (in white) against Liberty Professionals (in red) during the FA Cup semi-final. The heroics of goalkeeper Abass Mohammed helped second-tier side Okwahu United to reach the final of this season’s MTN FA Cup beating Liberty Professionals 3-2 on penalties on Sunday night in Kumasi. Both teams were tied at 1-1 after extra-time and during spot-kicks scored three out of four kicks to make it to a fourth final. Liberty Professionals talisman Latif Blessing scored an opportunistic goal just on the stroke of half-time after being put through by Issah Mohammed Shaibu albeit some poor defending from defender Aikins Baffour. The Ghana Premier League top scorer with 13 goals initiated the move and played a lovely one-two with Shaibu whose pass went in front of Baffour but the centre back’s could not shield the ball properly and Blessing slotted in his leg to connect home the first goal. But Okwahu United were not disheveled and came back strongly into the second half. Their fighting spirit earned them the equalizer through McClean Ampadu on 63 minutes with a fine finish from inside the box. From there, erratic shooting from both sides denied them the match winner and then to spot-kick. Anthony Nimo converted the first kick and Richard Appiah missed his for Okwahu United.